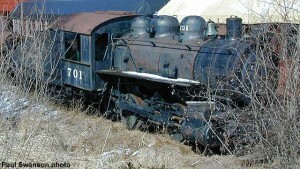 #701 in storage in April 2000. Paul Swanson photo. 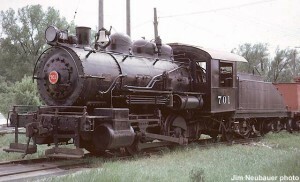 #701 was built by the Schenectady works of American in 1914 for Chicago & Illinois Western. She was later sold to Consumers Co. and in 1959 was donated to the Railway Historical Society of Milwaukee which soon became Mid-Continent Railway Historical Society. #701 at North Freedom, 1963. Montgomery Ward film. Ron Jones photo, MCRM collection. Hillsboro, WI; June 1962; Jim Neubauer photo. 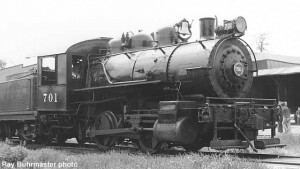 #701 was the first steam locomotive in Mid-Continent’s collection and was moved to Hillsboro, Wisconsin in 1962 where she was joined by #1385 for the museum’s first season. #701 was moved to North Freedom in 1963 when the museum acquired the property there.